Volunteer docents lead tours for the thousands of students and other visitors who visit the museum every month. 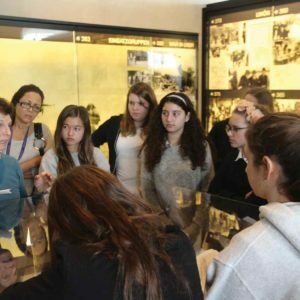 During the training, which begins on Sept. 27 and meets every Wednesday for 10 weeks, trainees will learn about the history of the Holocaust, become familiar with the museum’s collection of exhibits, participate in tours, listen to lectures and master gallery teaching techniques. The Los Angeles Museum of the Holocaust is located at 100 The Grove Drive. For information, contact the museum’s director of education Jordanna Gessler at (323)651-9910 or jordanna@lamoth.org.